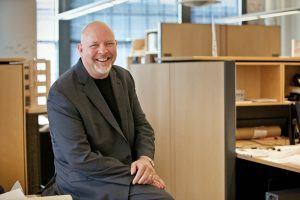 In the following Q&A Case Study, HGA planner Dave Paeper discusses how “Discovery Learning” inspired the interactive planning process for Marquette University Opus College of Engineering’s new Engineering Hall. 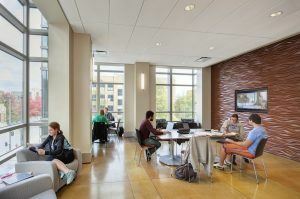 Tell us about the interdisciplinary goals Marquette University had for the Engineering Hall. When I became engaged in the vision for an Engineering Hall for Marquette University’s Opus College of Engineering, the College was being led by Dr. Stan Jaskolski, a visionary Dean that had come out of retirement as Eaton Corporation’s Chief Technology Officer to lead the College’s transition to a more hands-on pedagogy he described as “Discovery Learning.” Dr. Jaskolski’s vision for the future of engineering education, particularly at Marquette University, was an interdisciplinary, experiential, transparent experience where engineering was proudly put on display. What design process techniques did you employ to help the client achieve these goals? Did these techniques/tools differ from when you pursue a non-interdisciplinary project? As we started working with Marquette, we realized that Dr. Jaskolski’s vision was not yet widely understood by the College of Engineering’s stakeholders. To address this, we started by conducting an initial day-long Visioning Workshop—with participants including the Dean, faculty, students, industry partners, and design-build partners—to lay the groundwork for a broadly ­shared vision for engineering education and specifically a new Engineering Hall at Marquette. Multiple work sessions with each engineering department slated to occupy the new building produced initial space needs. Work session with the steering committee composed of the engineering department heads and the University Architect, where we reviewed and prioritized space needs, adjacencies, and design criteria. The ideas and recommendations from the departments and the steering committee were reviewed with the Dean on several occasions. These meetings formed a preliminary definition of the Engineering Hall—the Vision, the Guiding Principles, space needs, project size, and potential timing. This ultimately led to approval to move to full project design. Since the total space needs initially identified for the project exceeded the University’s funding capacity, the project was partitioned into two phases, with Phase 1 now completed and Phase 2 pending future construction. An important outcome of the work sessions is that it encouraged everyone to rethink their existing department silos and engage in a new direction for the project—one of integrated, cross-disciplinary engineering education that created connections between students and faculty, undergraduate and graduate students, and teaching and research. In short, Engineering Hall was built to prepare students to be leaders in technology and innovation on the global stage. This approach varied from other projects in that it included a broad cross-section of interested parties, including people outside the College working in industry, and a broad range of ages from students to senior engineering leaders. Cross-disciplinary engagement resulted in a cross-disciplinary design. What were some challenges uniquely associated with this project that can be attributed to its interdisciplinary nature? Did overcoming these challenges result in original insight into the client’s goals for the project? Phase 1 introduced pedagogical changes, and cultural changes in the ways the engineering departments collaborate. One challenge in creating an interdisciplinary facility was to facilitate intermingling between faculty and students and between faculty across departments, with a focus on project-based problem-solving. 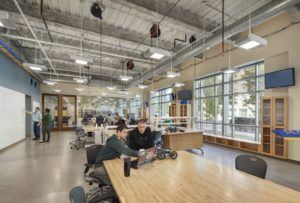 To achieve this, the building creates small-scale suites of faculty offices, student meeting spaces, classrooms, and research labs that are grouped by areas of interest. This provides a vehicle for interaction between faculty of different disciplines, whether serendipitous or scheduled, as they investigate and discover ways to solve real-world problems that require multiple disciplines—a convergence of previously separated people and ideas. The cultural challenges of breaking down silos is challenging, but approaching this process with a unifying vision and engaging others in that vision in a way that builds consensus—even if not everyone adapts to the change at the same time—is a massive step in true and lasting change. Following the completion of Phase 1, the University sought to envision what a future Phase 2 should be. It could not be a replica of Phase 1; it needed to be a facility where engineering students could, through learning, experimentation and research, learn to solve the world’s biggest engineering challenges of the future. To provoke original insights into how this could be accomplished, we conducted a series of Visioning Workshops with the theme “Engineering 2050.” These sessions focused on expanding the cross-disciplinary focus of Phase 1 to address the world’s biggest challenges in 2050. As we conducted interactive sessions with students and faculty to define what the future engineering challenges will likely be, several insights became clear. The future of engineering will be based on team-based solutions. Engineering education will continue to evolve along the path of problem-based teaching and learning, supported by experiential, hands-on projects to facilitate team-based solutions. Engineers of the future need to be “integrators”—attuned to and fully capable of integrating with a much broader set of specialties at a wide variety of scales, from nanoscale to galactic scale. The specialties with which future engineers will collaborate include scientists, economists, politicians, physicians, technology experts, communications experts and many others. Collaboration will occur physically and virtually across disciplines, specialists, peer institutions, industry, and government agencies. The result of the Phase 2 Visioning sets Marquette University’s Opus College of Engineering up for the next steps in the evolution of engineering education. 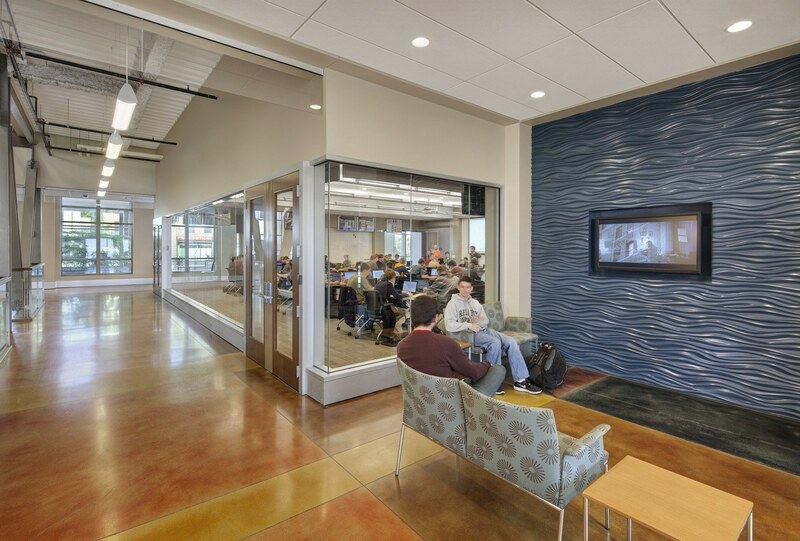 One discovery after the College moved into Phase 1 was that cultural change takes time—it took students and faculty some time to “live into” the new ways of collaborating, new pedagogies, and the new physical settings that the building created. We discovered that the architecture can enable—but not change—culture. As the world’s engineering challenges continue to evolve, as pedagogies and technologies change, and as the demand for high-quality, forward-thinking engineers increases, Phase 2 of Engineering Hall could become a reality. Did your design solutions create an enduring impact for the client? What aspects of your solutions might be indicative of future trends in interdisciplinary facilities? An enduring impact that Phase 1 created is the shift to experiential, hands-on discovery learning at Marquette University’s College of Engineering. The initial visioning process was key to providing the insights that led to this solution. Another transformation that resulted from original insights was the “House Concept,” to facilitate cross-disciplinary collaboration. Phase 1 is built around this concept, where a small group of faculty offices from different disciplines is collocated with a pocket lounge for students, and teaching and research labs to create a “House.” The houses blend disciplines to create centers of learning based on shared topics, such as bio-engineering or water resources. To support the learning and research occurring in the “houses” that reside on the upper floors in flexible modular zones, highly visible large-scale labs, shops and meeting rooms were located on the lower floors, providing convenient access for students, faculty, and guests. These original insights have provided an enduring positive impact for the College of Engineering and its faculty and students. The future of engineering will be based on team-based solutions as collaboration occurs physically and virtually across disciplines.